While designing a drawing room, sometimes people least care about a centrepiece coffee table. It may not be the first piece of furniture you pick for your home, but it can be an absolute statement for your living room. If we keep aside the usefulness of a coffee table, it is entirely undeniable that a coffee table is a perfect notch which ties up the whole living room. So, if you are also searching for a square coffee table to give your living room a complete feel, we can help you out quickly. Let us have a look at the list of top 10 square coffee tables of 2019. The Emerald Home wooden coffee table has a sleek polished look that can easily be a statement piece in your living room. 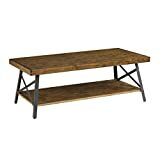 The rustic brown color easily blends with any kind of living room and also the metal frame finishing of this table provides the durability. It is easy to assemble and has a bottom shelf to provide you with some extra room. Product dimension– 48 x 24 x 18 inches. Solid wood top with metal frame. If you are looking for a big square coffee table for your living room, the Simpli Home Skyler coffee table will fulfill your wish. Handcrafted with solid mango wood, this coffee table has black metal frames and legs. The dark cognac brown stain adds a certain elegance to it along with a protective NC lacquer. Also, it has a large bottom shelf where you can easily toss your morning newspaper while sipping your coffee. Product dimension– 34 x 34 x 18 inches. Lightweight and has a great finishing. It has black metal frames and large open bottom shelf. For those, who are looking for a Matt finished coffee table, the International Concepts OT–60SC coffee table would be a perfect choice. Along with the unfinished color texture, this coffee table is made of para-wood. It is lightweight and can be assembled easily. Also, it has wood finishing all over it. Product dimensions– 36 x 36 x 18 in. Made of para-wood and wooden finishing. With rich finishing touch and centre hidden drawer, this ioHOMES Celio square coffee table is a compact table with a sleek red coca color texture. 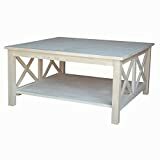 Made of medium fibre board construction, this coffee table can be perfect for every kind of living room. It can be assembled easily and also has an easy instruction for cleaning it up. Product dimension– 36 x 36 x 16 inches. It is made of fibre board and has a laminate red cocoa finish. It has a hidden centre drawer. 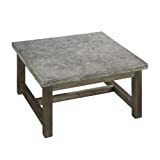 Made of moulded concrete with a solid wood base, this Home Styles Square coffee table has a unique look to fit in your living room. The top of the table has a metal finishing touch while the base of this product has weathered brown finishing. Slightly heavyweight, this coffee table is suited for indoor or outdoor seating purpose. Products dimension– 36 x 36 x 18 inches. It is made of moulded concrete with a solid wooden base. It has a matt brown finishing touch. Perfectly suitable for indoor and outdoor. Made of solid oak wood, this Abbyson Adam’s Morgan Square Coffee Table has a rich espresso colour along with a unique contemporary design. It is lightweight. Also, it has a compact shape that is perfect for any indoor use. It is durable and has a long lasting user warranty as well. Product dimension– 44.4 x 44.4 x 18 inches. It is made of solid oak wood. It has a rich espresso finishing touch and colour texture. The tall, elegant legs of this product add a certain charm. The unique unfinished colour texture has made this International Concepts OT–70SC square coffee table number three on the list. Made of parawood, this coffee table has a unique x-shape and has a big bottom self too. Also, it can be assembled easily without any hassle. Product features– 36 x 36 x 18 inches. It is made of para-wood. 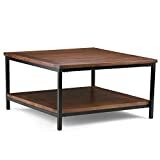 This International Concepts Solano Square coffee table is the perfect choice if you want a long-lasting and durable coffee table for your living room. 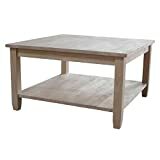 Made of solid para-wood, this unfinished textured coffee table has a spacious bottom shelf. Also, it is lightweight too. Product dimensions– 32 x 32 x 18 inches. It is lightweight and spacious. It is made of parawood and can be assembled easily. 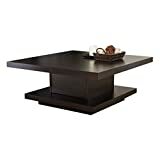 The Charcoal brown colored Simpli Home Monroe Square coffee table stands as the top seller on this list. Handcrafted with solid acacia wood, this coffee table is durable with a protective NC lacquer coating. It also features two spacious drawers and folding hidden drawers which account for large storage space. Also, it is perfectly sized and has the antique brass hardware. Product dimension– 38 x 38 x 18.5 inches. It is made of solid acacia wood. It has distressed charcoal brown stain finishing. It has two drawers and a folding hidden drawer for storage. 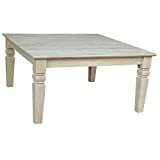 Depending on your need and demand, now you can choose the best square coffee table from the above list. Happy Purchasing!